Mascolo struck out the side in both the third and fifth innings, as the hurler faced the minimum 15 batters over the first five innings of play. A lead-off single broke up a no-hit bid in the fourth inning, but a 6-4-3 double-play and an inning-ending strikeout kept Mascolo on track to face the minimum. 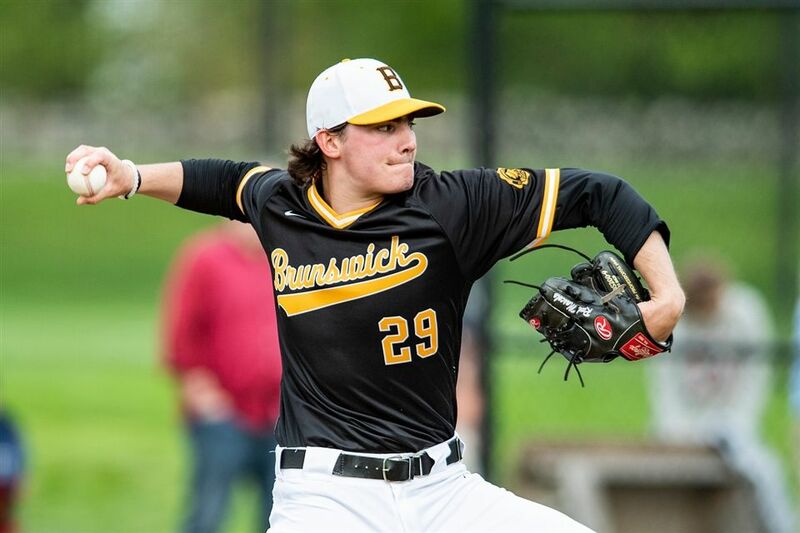 Brunswick scratched across single runs in the first and second innings, as Mascolo took a 2-0 lead into the sixth inning. Fieldston’s lead-off batter reached on an infield error and advanced to second. After Mascolo struck out the next batter, another Eagle reached on infield error as the runner on second moved to third base on the play. With one out, a Fieldston sacrifice-bunt plated the runner on third base, narrowing the Brunswick lead to 2-1. In the bottom of the sixth, the Bruins responded with a three-run rally started by a four-pitch, lead-off walk to Jake Hyde. Jack Mathews then reached on an error, as Hyde moved to second on the play. Luke Fisher followed with a two-run double to left, as Fisher advanced to third on the throw home. With a 4-1 lead, Marc McGuire drove in Fisher with a single to left to give the hosts a 5-1 lead. Mascolo tossed a 1-2-3 seventh for the complete game win, facing just three more batters than the minimum 21 over seven innings. For the day Mascolo (1-0) struck out 12, allowed no walks, hit one batter, and allowed one unearned run. Fisher led the Bruins from the plate with two doubles, two RBI, and two runs scored. Leo Socci and McGuire each added a pair of singles and an RBI, as Aidan Redahan also collected two singles. Brunswick will have a busy upcoming week, as the Bruins have six games scheduled over six straight days, starting with a road game against league foe St. Luke’s on Monday, April 8.